Alcoholics Anonymous is famous for their program to help people attain and maintain sobriety. With the latest addiction being everything technology, there is now a movement toward "technology detox" or the AA equivalent, Technology Anonymous. I remember reading months ago about people so addicted to the Internet and online video games that they literally had to be institutionalized to get them to eat, sleep, and return to some sort of normal life again. Apparently, technology taken to the extreme can be no less an addiction than smoking, drinking, of fooling around. And there is even a Facebook page for Internet and Technology Addiction Anonymous (ITAA). I've recently even heard of challenges for people to turn off their technology for even 24 hours; apparently this is a tough thing even for just that one day--wonder if you can do it? The Wall Street Journal (5 July 2011) reported on someone who "signed up for a special [vacation] package called "digital detox," [that] promised a 15% discount if you agree to leave your digital devices behind or surrender them at check in." The message is clear that people "need a push to take a break from their screens." - 79% expect to remain connected for all or some of the time on their next vacation. - 68% (up from 58% in 2010) say they will check email while on vacation--daily or more frequently--for work. - 33% admitted to hiding from friends and family to check email on vacation. - Also, 33% check email on vacation while engaged in fast-paced activities such as skiing, biking, and horseback riding. For people routinely checking email as many as 50-100 times a day, going on vacation and leaving technology behind can be a real shock to our social computing systems. Should I even mention the possibility of not logging unto Facebook, Twitter, YouTube, Flikr, etc. I see people convulsing and going into withdrawal just at the thought. So what is this technology addiction we are all on? There's no nicotine or alcohol or testosterone involved (except in some extreme video games, maybe). Incredibly, for many technology is the first thing we check in the morning and last before we close our eyes at night. It even lays on the night table right next to us--our spouse on one side and our smartphone on the other. Which do you cuddle with more? It's scary--technology is an addiction that is not physical, but rather emotional. It is the thrill of who is calling, emailing, texting, friending, or following us and what opportunities will it bring. Like Vegas or a lottery ticket...technology holds for us the possibility of love, friendships, sexual encounters, new job opportunities, fame, fortune, travel, and so on. There is no limit, because technology is global and unbridled and so is our ambition, desires, hopes, and even some greed. Sensors will soon be everywhere--waiting, watching, and working to capture information about you and the environment we inhabit. Every sensor is an opportunity to collect data and use that data for making better decisions. Of course, we see sensors deployed first and foremost from our military overseas, in Iraq and Afghanistan, which uses drones to spy on and strike on our adversaries. The drones are really flying platforms of sensors and in some cases with weapons at ready. According to the New York Times (20 June 2011) "From blimps to bugs, an explosion in aerial drones is transforming the way America fights and thinks about its wars..the pentagon now has some 7,000 aerial drones...[and] has asked for nearly $5 billion for drones for next year." These drones are providing "a Tsunami of data" from intelligence, surveillance, and reconnaissance. The change to drones is so significant in our military that the Times reports that "already the Air Force is training more remote pilots, 350 this year alone, than fighter and bomber pilots combined." Similarly, the Wall Street Journal (5 July 2011) reports that another type of sensor--surveillance cameras--are being deployed big time in China with a new surveillance network in Chongqing of 500,000 cameras (Beijing already has 280,000 cameras in its system) "that officials says will prevent crime but that human-rights advocates warn could target political dissent." While this project is significantly larger and more aggressive than other cities have deployed, China is certainly not alone in deploying surveillance cameras in their cities--Chicago has 10,000, New York has 8,000, and London has over 10,000. According to the WSJ, the overall market last year for surveillance-equiptments sales, not including networking gear or software totaled $1.7 billion! So smile, you are on camera--and it's candid, indeed. A third article ran in Government Computer News (July 2011) on a more innocuous type of sensors to be used--this being the mass deployment of mobile sensors for the National Weather Service (NWS) on vehicle fleets such as Greyhound buses etc. Beginning in October, "2,000 commercial vehicles will be equipped with sensors...and will be sending data to NWS in near real time. We will be rolling out coverage on the national level." The mobile sensors will be taking 100,000 observations daily--every 10 seconds, about every 300 meters--measuring temperature, humidity, dew, precipitation, and solar information." In the future, we are looking at the potential of a "a sensing probe in every car"--for collecting information on hazardous roads, traffic patterns, and preventing accidents. Other applications for mobile sensors could be for "monitoring chemical and biological agents," nuclear and radiological ones, or CO2 and Ozone and more. 1) Surveillance--the monitoring of events by those above, the authorities--with CCTV etc. and monitoring events from control rooms, potentially from anywhere around the world. 2) Sousveillance--the monitoring of events by those below, the citizens--with everyday smartphones, cameras, and videocams and posting the digital images and sound bytes to YouTube, Facebook, Twitter, and so on for the world to see. With IPV6 providing enough Internet address for attaching sensors to every atom on the surface of the earth and sensors becoming smaller and more imperceptible, we can soon monitor and report on everything, everywhere all the time. Some of the biggest challenges remain ensuring the information monitored is kept secure, private, and used legally and ethically and sifting through all the data to identify the truly meaningful information from what's just noise. Often it seems as if so much of our life is spent memorizing things and then trying to remember what we thought we memorized. It starts in grade school and continues throughout our education--memorize, spit back, repeat. Advances in education may actually recognize the need and try to get kids to think now-a-days, but there are still all the "fundamentals" that need to be put to memory, so you can pass the standardized tests like the SAT, GRE, GMAT, LSAT, MCAT, and more. But we don't just memorize to pass tests, we pride ourselves on what "we know" and we test ourselves and show off our expansive knowledge-base through things like board games such as Trivial Pursuit to game shows such as Jeopardy. At work too, we hire, retain, and reward people based on their "knowledge, skills, and abilities" and recognize those who are true "subject matter experts." I remember friends who used to read the encyclopedia to increase their knowledge, and the Almanac with all the facts and figures--is still a best-seller. In Yeshiva, we also spent a good part of our high school years, memorizing from the Talmud. The challenge for us in the 21st century is that knowledge is growing so fast that we as individuals can barely keep up with the volume and pace of change, so we specialize professionally and seek expert advice from others on areas outside our area of specialization. Still we memorize and try to remember as much as we can. We read, watch TV, browse the Internet, travel, try new things, and fill our heads with incessant facts, memories, and chatter. And we become frustrated when we can't remember names of people we recently meet, the punch line to a joke, the facts for a presentation at work, the spelling of a simple word, or even what we had for breakfast. So rather than memorize and forget, people are turning to capturing events from their lives and playing it back when they need to recall information or are feeling nostalgic. We do this when we take photos, videos, audiocasts, blog, tweet, etc. and then access these from our hard drives or the Internet though services like Flikr, YouTube, Podbeam, Blogger, Twitter, and so on. Now we starting to move beyond recording just moments in times (i.e. snapshots) and instead capturing it all! 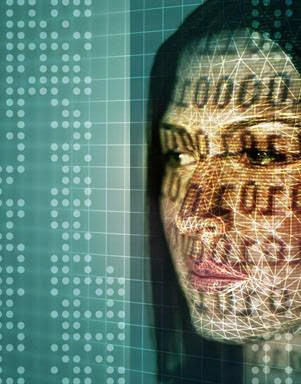 The Futurist (July-August 2011) reports that people are discovering things like Lifelogging--where through cameras, recording devices, and storage media, they record virtually "every instant of their lives." We are nearing at a time, when this is becoming "not only feasible, but possibly even appealing" to the masses. By recording the events of our life--whether in blogs, photos, audio or video recordings--and combining this with advanced search tools, lifelogging "could provide us with the equivalent of near total recall." Perhaps the ability to capture more and more of our lives digitally will make it unnecessary in the future to sit and memorize so many useful and useless facts and information. We don't have to remember everything in our heads, we just need to know how to access the information when we need it. Learning does not have to be about memorizing but rather can be about critical thinking, and being an expert does not have to be about what you have memorized, as much as your experience and ability to think through problems and find solutions. This was a presentation I gave on Cloud Computing in February 2011 at the Technology Council of Maryland. A new proposed method for determining Cost of Living Adjustments (COLA) for people receiving Social Security and federal and military retiree pensions is called the Chained Consumer Price Index (CPI). The Federal Times (18 July 2011) reports that "proposed COLA changes would mean smaller annuities for retirees." Essentially, the Chained CPI doesn't just look at the change in prices for "market basket" of goods, but it "takes into account...the fact that most consumers change their buying habits when prices go up." If the price of an Apple goes up from $1 to $2 instead of COLA being adjusted so that retirees get $2 for the apple, we give them instead maybe $1.25, since we ASSUME that because the price of apples went up "people are likely to buy fewer apples or switch to a cheaper fruit." Does that sound right from your shopping experience? Are you going to buy fewer apples or are they sort of a necessity? Further, if the price of apples goes up, is it not likely that the price of other common fruits will go up in an inflationary environment as well. This proposal which is estimated "to save $300 billion in its first decade" sounds like quite the fuzzy economics indeed. So how do you like those apples? The first Department of Defense Strategy for Operating in Cyberspace is out (July 2011). "DoD is particularly concerned with three areas of potential adversarial activity: theft or exploitation of data; disruption or denial or service of access or service..., and the destructive action--including corruption, manipulation, or direct activity that threatens to destroy or degrade network or connected systems." "Cyber threats to U.S. national security go well beyond military targets and affects all aspects of society. Hackers and foreign governments are increasingly able to launch sophisticated intrusions into the networks and systems that control civilian infrastructure." "Every year, an amount of intellectual property larger than that contained in the Library of Congress is stolen from networks maintained by U.S. businesses, universities, and government departments and agencies." The strategies for cyberspace protection in the DoD plan include treating cyberspace as an operational domain; innovation; partnership; and so on. But we need to leverage our strengths even more. As the Wall Street Journal pointed out on 15 July 2011: "The plan as described fails to engage on the hard issues, such as offense and attribution." If we can't even identify who's attacking us, and fight back with precision, then we're flailing. Some may express the concern that we would have all-out war by attacking those who attack us. However, what is the alternative besides confronting our aggressors? The concept of operations is straightforward: Any computer device that is used to attack us, would immediately be blocked and countered with equivalent or greater force and taken out of play. This would mean that we are able to get past cyber-bot armies to the root computers that are initiating and controlling them, and dealing with them decisively. This would hold regardless of the source of the attack--individual or nation-state. The DoD plan acknowledges our own unpreparedness: "Our reliance on cyberspace stands in stark contrast to the inadequacy of our cybersecurity." As in the Cold War, there must be no doubt with Cyber Warfare (as with nuclear) of our ability to inflict devastating second-strike or preemptive attacks with deadly precision. Until we have unambiguous hunter-killer capability to identify and locate perpetrators of cyber attacks against us and the ability to impose swift justice, we are at the mercy of our aggressors. We can only have peace in cyberspace when we have the strength to stand up and defend it. Now we must move with cyber speed to build this capability and stand ready to execute our defenses. Admiral Mike Mullen was quoted this week (18 July 2011) in Federal Times as saying: "The single biggest existential threat that's out there is cyber...It's a space that has no boundaries. It has no rules." We must become even better--much better! TaskRabbit is a new way to get odd jobs done by simply posting them online for others to bid on and perform them. The service is available in LA, San Francisco, Orange Country, Boston, and NY--so far. You, the "Sender", go online and name and describe the task, including when and where you want it done as well as the maximum you are willing to pay. "Runners" are alerted and bid the minimum that they are willing to accept to do the job. You review the bids and select one. The runner performs the work. You review, rate, and reimburse for the work. Wired (August 2011) calls TaskRabbit the "eBay for real world labor," although there are other competitors out there such as AirRun and Zaarly. In TaskRabbit, "Customers pay by credit card, and the runner's share gets deposited into a TaskRabbit account, with checks cut every Friday." "TaskRabbit takes 12-30% cut of each transaction." 97% of tasks get a bid from at least one runner and 75% of tasks get completed. If you want to become a Runner-- you apply through a 3-step process that includes an application form, video interview, and a federal criminal background check. Gaming mechanics is used to rank top runners, display their experience level and average customer reviews, and provide them a progress bar to show points needed to get to the next level. TaskRabbit fills an important niche in our society that is increasingly time-presured, convenience-oriented, and service-based and where more and more people hire themselves out as consultants, freelancers, and Guy/Gal Fridays. While I can see the benefits to people who need to get work done and for people looking for work, there is something about this process where we bid out our labor by the individual task--like in the video where we need someone to pick up dog food--that it can get a little degrading and meaningless. No longer are we hiring people for their knowledge, skills and abilities for long-term contributions and growth prospects, but rather we are tasking out the smallest and most mundane of tasks to the lowest bidder. Harvard Business Review (July-August 2011) in an article called "The Age of Hyperspecialization" wrote of the new social challenges with companies such as TopCoders that crowdsources out IT work to 300,000 freelance developers in more than 200 countries, such as: "the possibility of exploitation as work quickly finds the cheapest takers, and the opportunity for deception when workers can't see the larger purpose to which they are contributing." Crowdsourcing or outsourcing these everyday tasks can bring speed and quality to what we are looking for, but the true cost comes in terms of "digital sweatshops" and potentially "dull and meaningless" work. Is this level of economic efficiency going to cost us all more in the end? Great job by the Silhouettes last night on America's Got Talent. An inspiring remembrance for upcoming 10-year anniversary of 9-11. Truly, the land of the free, brave, and talented. I've always been interested in maps, geography, and geospatial information systems (GIS). Coming across Greg's Cable Map--I thought this is sort of idiosyncratic, but fascinating too. This is an interactive map of our global undersea telecommunications infrastructure. If you ever wondered how you were able to connect with someone anywhere in the world in split seconds (satellites aside--since we all don't have immediate access to that), here it is. How it works: Either you can search the list of cables of the right, click on any one of interest and it highlights it on the map for you or vice versa click on a telecommunications link on the map and it bring up in the right-hand column the points of the cable landings and reference to more information . 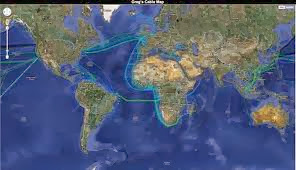 There is also the ability to click on the bottom of the map on the check boxes for either or both the active or future cable links to see where we are now ("as-is") and where we are going ("to-be") in terms of Internet connectivity. Next time you read in the newspaper about a large-scale Internet outage like the multiple ones that occurred when undersea cables were cut in the Mediterranean in 2008 causing outages from the Mideast to India, you can look it up here and see for yourself how "the foot bones connected to the ankle bone." There are currently more than 2,000 infographics at this site; this is a true online treasure trove for those who like to learn visually. The infographics are categorized in about 21 areas including technology, science, business, the economy, the environment, entertainment, politics, and more. I've included an example, from the Social Media category, of an infographic called The Conversation Prism developed by creative agency, JESS3. As you can see this infographic displays the spectrum of social media from blogs and wikis to Q&A and DIY sites--it is a virtual index of social media today. What I really love about infographics is that they can convey such a wealth of information in creative and memorable ways. Moreover, there is such a variety of infographics out there--basically these are limited only by the imagination of the person sharing their point of view and their talents in conveying that information to the reader. As someone who is very visual in nature, I appreciate when the content is rich (but not jumbled and overwhelming), and when it is logically depicted, so that it is quick and easy to find information. 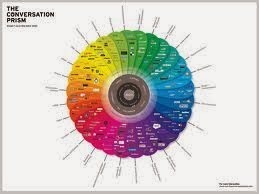 In the example of The Conversation Prism, I like how it comprehensively captures all the various types of social media by category, color codes it, and visualizes it as part of a overall communications pie (or strategy). To me, a good infographic is something you can relate to--there is a aha! moment with it. And like a great work of art--there is the opportunity to get a deeper meaning from the visual and words together then from the words alone. The shapes and dimensions and connections and distances and colors and sizes--it all adds meaning (lots and lots of context)--I love it! I could spend hours at a site like visual.ly learning about all the different topics, marveling at the creativity and meaning of the information being conveyed, and never getting bored for a second. Freedom of speech is one of our most precious rights. However, there are limits - times when the right to speak and publish comes up against the principle that one should not cause harm to others. The famous example is that you cannot falsely cry, "Fire!" in a crowded theater. Free speech--yes; harm to others--no. This week (11-17, July 2011), a BusinessWeek article called "Set Them Free" exemplifies what can happen when free speech goes too far. The article is an argument in favor of illegal immigration. The author's thesis is stated in the form of a rhetorical question: "Laws against illegal immigration make little economic or moral sense. So why punish the brave citizen who break them?" Certainly, I am sympathetic to newcomers to our land. I come from a family of immigrants, like so many American citizens, and I value the opportunities and freedom this country has provided to me and my family. However, in this article, the author openly promotes breaking the law. He supports "illegal" immigration and calls for others to facilitate it. One can argue about economics and morality of immigration policy, but from my perspective, obviously, no country can have fully open borders. Logically, this helps to ensure safety, security, and social order. Coming up on the 10-year "anniversary" of the events of 9/11, this is a no-brainer. Not only does the article ignore this point, but it brazenly calls the laws against illegal immigration "immoral." The author stretches the limits of free speech beyond the breaking point in my view, when he recklessly states: "When a law itself prohibits doing the right thing, when it is immoral rather than just annoying or inconvenient, and when breaking the law does no great harm to any others, it is justifiable for people of conscience to chose to break that law." He literally states that illegal immigration is "the right thing (!)" How can a mainstream media source publish such extremist rhetoric, even going so far as to compare the U.S. laws to apartheid: "Current, U.S. immigration laws have all the moral standing of pass laws in apartheid South Africa." In addition to teaching us that free speech can be misused to spread extremism, hatred, lies, promote civil disobedience, and enable chaos, there are some other unfortunate lessons here. The first is that one must think critically about what one reads, even if it is in a supposedly "mass media" publication. For immigration is a blessing and a privilege, but not an entitlement. Nobody has the right to enter another country's borders at will, without restriction. Second, and more troubling, extremist thinking clearly continues to flourish not only outside our borders, but from fanatics within. While I agree that we should always be moral, help those in need, and make good economic decisions, this does not negate the importance of maintaining security and social order. Further, it is irresponsible at the very least to promote breaking the law, and offensive to compare illegal immigration as an issue of economic exploitation to the drastic human rights abuses of apartheid South Africa. For those of you who are upset to the see the final Space Shuttle mission this week, we definitely have something to look forward to with the new Orion, Multi-Purpose Crew Vehicle (MPCV) for manned space flight. The main saucer-shaped "Crew Module" can separate from the "Service Module" that contains the propulsion, water and oxygen for sustaining life, and cargo transport (this is similar to the flying "saucer" that could separate from the main body of the Star Trek Enterprise in later episodes). Orion will supposedly be the most advanced space vehicle out there to support missions from 4 to 900 days (virtually a full blown Star Trek voyage). It is being built by Lockheed Martin (an early supporter of the United Federation of Planets?) 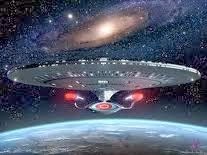 and will have advanced life support, propulsion, avionics, and thermal protection for reentry (and hopefully in development are the phasers, photon torpedos, phase modulating shields, warp core, and transporter). The Orion will be able to transport 4 crew and may be augmented by Robonauts (sort of like Data the android, but with no personality yet). Robonauts are engineered by a collaboration of NASA and General Motors, and according to GM, they will help automate "dull, repetitive, and ergonomically challenging tasks" and make us more efficient in both the aerospace and automative industries. Note: A robonaut is currently up on the International Space Station for testing (a precursor to Deep Space Nine). Progress is being made, cool things are coming, and we will hopefully all be fortunate to see it unfold. This week we watched with horror as a Texas baseball fan and firefighter fell to his death attempting to catch a ball hurtling into the stands. This man overreached in this case, and went to his death in order to try and catch a baseball! He did an ordinary thing and it cost him his life--right in front of his son. Ironically, the same day, the Wall Street Journal (8 July 2011) has an article called "The Taming of The Fans," about what they call "rowdy fan bases" and efforts to control the craziness. In response, a "fan code of conduct" is being adopted by some. About a month ago, there was the riots in Vancouver after the Stanley cup was lost and from the chaos came the now famous photo of the kissing couple, the girl having been injured and on the ground in the mayhem. We live in an unpredictable world--where things can get out of control. When rationality, morality, and a sense of moderation get away from us, thenterrible things happen--death, destruction, chaos. And of course, this is not limited to fans of sporting events and rock-and-roll concerts. This week, we watched with mouths agape as people like Casey Anthony and Dominique Strauss-Kahn basically walk away from some very serious and terrible charges. While no one can say what really happened, we were all really shocked at the outcomes. For months now, we have been watching with indignation as various Middle-East dictators shoot, kill, besiege, and round up their own people in order to maintain power in the Arab Spring. Lara Logan, the CBS reporter, who was sexually attacked and brutally beaten by a mob in Egypt's Tahir Square during the riots in February, is another recent horror tale that speaks volumes about people going to non-sensical extremes and committing atrocities. The images and sound bites are there basically everyday of people, organizations, and societies going to the extremes and doing unthinkables--really these are burned into consciousness (for others it's in their subconscious). People are willing to go to all sorts of extremes to get what they want, do what they believe, or just to go sheer crazy. Sometimes, those efforts are rewarded and others get their due--in the end, I believe justice prevails in this life or the after. Our world sits on a fine line between sanity and insanity--life and death. People are tempted "to go for it" to get what they want all the time. But the challenge is to weigh the cost and benefits and chose our actions carefully. There is a domino effect to our choices--and we own the consequences. Will we pull ourselves back from the edge--when the ball is coming our way in life? I have a new article in Public CIO Magazine(June/July 2011) on the subject of our fascination with "extreme size" in technology. From super-sized televisions and mega data centers to smaller and smaller personal computing devices, we are attracted to the computing on the edge. 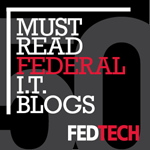 Read the article at Public CIO Magazine. For July 4th, we headed down to the D.C. Folk Life Festival today on the Washington Mall. 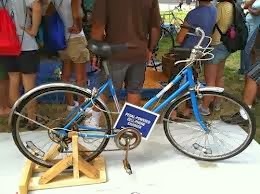 The Peace Corps had a number of exhibits at the festival, including one on what they call "Appropriate Technology." Appropriate technology is about being user-centric when applying technology to the local needs and realities on the ground around the world. 1) Affordable--technology has to be affordable for the people that are going to use it. Even if it saves money in the long-term, it has to be something that can be acquired by people without access to traditional financing in the short-term. 2) Local--the material must be available locally in order to make it accessible to people living in remote and even dangerous parts of the world. 3) Transparent--the design of the technology must be transparent with the assembly instructions available to the local people, so that it can be maintained indigenously. 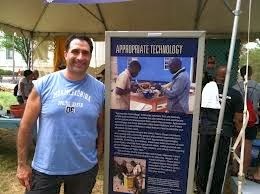 One company that is helping needy people around the world using appropriate technology is Global Cycle Solutions. 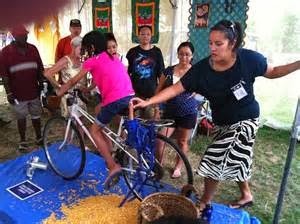 Since bicycles are routinely found around the world, these add-on devices that help in food preparation and communications are practical and cost-effective. Appropriate technology is not a technical term and the concept is not rocket-science, yet if we just keep in mind the people we serve--what their needs are and what constraints they may be living under--we can make solutions that are functional, cost-effective and sensible, and we'll can help a lot of needy people in the world, bells and whistles aside. It is said that one of the key differences between leaders and staff is that leaders are supposed to spend significantly more time on relationships, while staff tend to concentrate on the task at hand. A number of professors from the University of Virginia indicated that leaders who didn't spend at least 50% of their time and effort on relationship building, tended to be much less successful professionally. In others words, as you advance from staff to management, you job changes from being the "technical expert" to spending more time solving specific problems and building relationships. Additionally, managers who delegated, supported, trusted, and empowered, and didn't micromanage the tasks--we're the kinds of managers/leaders that people wanted to work for and would give more of themselves to. So leaders who excel at building meaningful professional relationships, benefit not only from developing important and trusting networks of people around them, but also from actually developing a more satisfied and productive workforce. 1) Identifying and surrounding yourself with people that are smarter than yourself--relationships are most fruitful and enjoyable with someone that can challenge you. 2) Reaching outside your "normal" boundaries (organizational, functional, industry, geography) to diversify the sphere of influence--new ideas and best practices are not limited to any one domain. 3) Ensuring that integrity and trust are cornerstones of any any relationship--there is no compromising values and principles for any relationship! 4) Giving of yourself in terms of self-disclosure, assistance to others, and our most precious resource of time--relationships are not built on thin air, but involve work by both parties; it's an investment. Finally, while relationship-building is critical to leadership success, it is important to surround ourselves with the "right" people as Harvard Business Review (July-August 2011) states this month: "Bring people with positive energy into your inner circle. If those around you are enthusiastic, authentic, and generous, you will be too." So choose your professional network as carefully as you would choose your friends. Sometimes there is a moment that really captures the essence of being alive. I had that kind of moment watching this great band, Lucky Dub, sing their song "No Money, No Worries." This song seemed especially apropos in today's challenging times. But the guy dancing to the music really stole the show--he was so freed by the music and living in the moment. It was a joy to watch! Thanks to G-d (and Apple) that I was able to capture it on video. What is with the iPhone and food? Yesterday, one of my dear wonderful relatives showed me a blog with a recipe and pictures for the iPhone cake from the end of last year. Like who would think of eating an iPhone--even as a cake??? Then today, I came across, the iPhone fruit bowl--an iPhone made up of all different colorful fruits posted to YouTube this week. As I started to get curious about this iPhone food phenomenon, I researched a little further. Now, I found iPhone cupcakes going back a few years to 2008. The iPhone was only first released at the end of June 2007, so only about a year after, the iPhone as food started making it's debut. 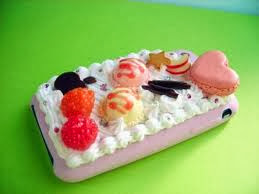 Then here's another twist on this, an iPhone food-encrusted case "decorated with whipped cream, berries, star-shaped cookie, heart-shaped macaron, ice cream and sliced apple." So, with the iPhone, what I thought was just an amazing technology, I have come to learn is in just about every sense of the word something to salivate over and when edible--chump away at. The iPhone not only makes us want to call home, search the Internet, listen to music, watch videos, and go Apps crazy, but also all the while build up a healthy appetite for more amazing technology innovation. 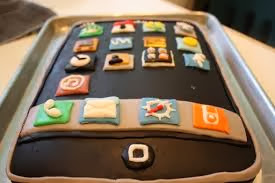 I think I'll have a bit of that iPhone cake now! P.S. 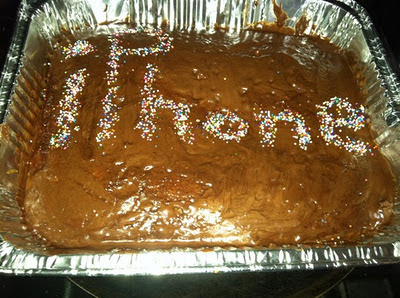 And here's my contribution to the iPhone's culinary delights--it's a yum chocolate cake that says "iPhone." Having professionally been around the block a couple of times now over a 25 year career, I can say with some conviction that soft skills are some of the hardest and most important things that you learn and which you need to succeed both personally and professionally. Soft skills are often equated with emotional intelligence and interpersonal aptitude. They includes a broad range of abilities--everything from diplomacy to dependability, social graces to skilled communications, conflict resolution to constructive feedback, and friendliness to relationship-building. People with soft skills are able to work well with others whether they are influencing, selling, negotiating, strategizing, or problem-solving. As a manager, soft skills also involve effectively delegating and empowering your people to perform and feel good about their jobs. While soft skills emphasize relationships, hard skills focus on the task. One mistake many people make is that in an effort to get a task done in the short-term, they sacrifice important long-term relationships--i.e. people burn their proverbial bridges, which makes getting things done over the long-term much more difficult, if not impossible, and also not very enjoyable--since you've just alienated your most important asset, your team! 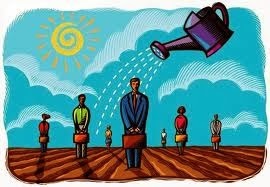 Essentially, the key to soft skills is to treat people with respect and goodwill, always! The Wall Street Journal (5 May 2011) describes how some top business school around the country are "getting it"--providing their students with soft skills business courses. Schools like Columbia, Stamford, and University of California at Berkeley are teaching their students not only accounting and finance, but also the "soft skills...important in molding future business leaders." Additionally, in my experience, post-graduate leadership courses such as from Dale Carnegie Training, The Center for Creative Leadership, and others provide solid soft skills training background. However, in my opinion, the real learning takes place in the classroom of life--when dealing not only with colleagues, but also with family and friends--when you see what works and what doesn't. We are all connected to one another--as children of G-d and neighbors in the global community, and the way we get along underpins our hard skill successes. Soft skills should never be equated with being easy, "sissy," or unimportant--the investments you make in people are the most important investments you'll ever make.